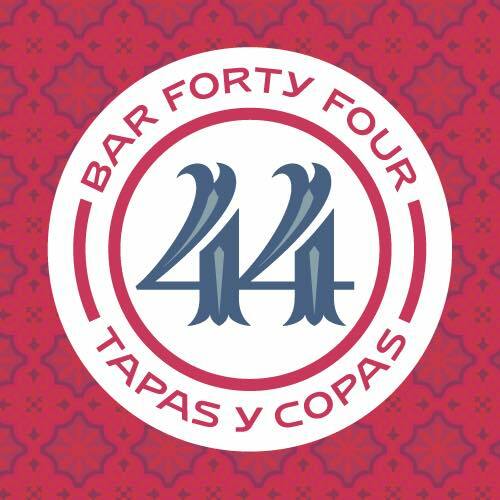 Tapas Y Copas - That's what we are all about! Gutsy Spanish produce and flavours cooked to order in our open kitchen and complemented by our 100% Spanish Wine, Sherry & Cava selection. Our extensive Cocktail List also has a distinct Spanish flavour to it. Always a great atmosphere , we are regulars and will be back soon. Our thanks to all! Always a lovely experience at Bar 44. Good quality food and service is fantastic. Staff are very attentive and make you feel very welcome from the moment you enter. Great you can get Avalon Sidre here, great addition to menu when having tapas. Excellent service despite it being a bank holiday. Food was delicious as always and great value children’s meals as well. The cocktails are highly recommended. The staff were welcoming, friendly and hard working. The food was delicious. A great combination of tapas, and the tastiest sour dough bread. Love Bar 44 but restaurant was a bit cold on Sunday as we had the lovely table by the window. Staff kindly moved us to rear where warner but lacking in atmosphere. Can’t have it all!! Amazing service and food as always. Really enjoyed the salmon fritters. Great service from staff and food was quick to the table. Thanks guys, will return. Always despite it being very busy. One of my favorite restaurants. Food is always of a high quality. Authentic and delicious. Good attentive service. Perfect for a relaxed lunch. Always visit here when in Penarth. Really great service, food, atmosphere. Delicious food- however portions are not generous enough for the price. Food was lovely and the atmosphere was really good and lived up to the Cardiff and Cowbridge venues as I’ve visted them on a regular basis. But was disappointed in the service we received. After booking because the manager gave us such a warm welcome when we went to enquire about a mother’s day menu a couple of weeks ago, I was disappointed in our server, unfortunately he didn’t make much if any conversation with us, didn’t come to ask if our food was okay during our meal and barely struck a conversation when he took the plates away. When we decided to remove the service charge from the bill (even though there was only 4 of us) my husband was made to feel guilty about doing this and was told he was going through a divorce by another member of staff, not sure how professional it was to say that, all due respect but we were made to feel guilty! I was disappointed because we paid quite a bit for the bill to come out feeling disappointed. Lovely service, great location, delicious food! We come to Bar 44 a lot for tapas (and love it!) but this was our first time having a Sunday roast. Well, WOW! It was absolutely fantastic, I thought it was going to be good but I didn't realise it was going to be that good! The food was delicious and so creative, the roasties were just incredible and the staff are always so friendly and accommodating. One of my favourite places to eat. Thank you for always being so consistent.